Accessories for Binderboard®: Check out our new items! Make checks out to Karen Strickler or Pollinator Paradise. Or, pay with a credit card or check using PayPal. After you accept the quote, we will send you a bill via the PayPal web site explaining how to pay. Osmia Binderboard® Our Binderboard have 8 holes per row, and they are held together with a strap. Tighten strap with a screwdriver. (5/16" diameter, 6" deep tunnels, 8 tunnels per laminate. Boards should all be protected from rain with a roof, and not left outside uncovered or where standing water during the winter could damage them. We are now using a strap for extra pressure on all sizes of Osmia Binderboard® except our smallest sampler (still available with bolts). Both designs prevent warping of the wood if the boards get wet. Read a cherry grower's experience with Binderboard®. Useful to attracted bees from their natural habitat for introduction into an orchard. Can be stacked for ease in transporting. 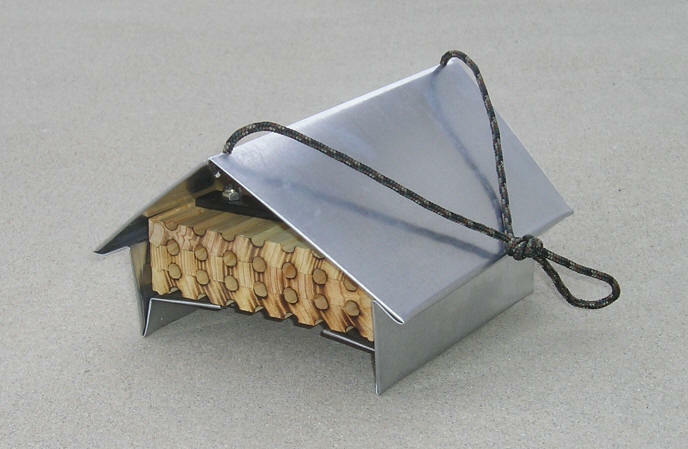 (see photo) Also available with cute gable roof for $27.55. Discount available for large orders (100 or more 104-hole boards). 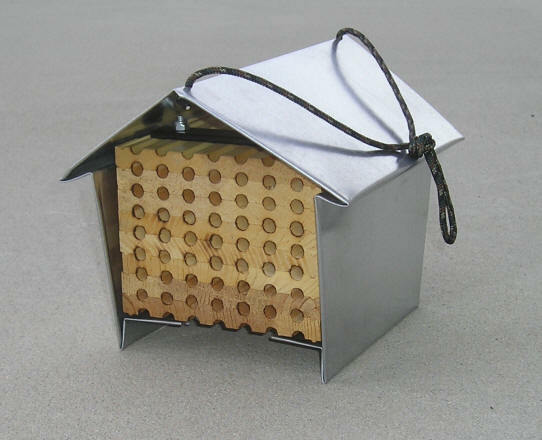 Contact Pollinator Paradise for shipping and handling charges and for large order prices . Straws, Roofs, Scrapers, bolt tightening device. 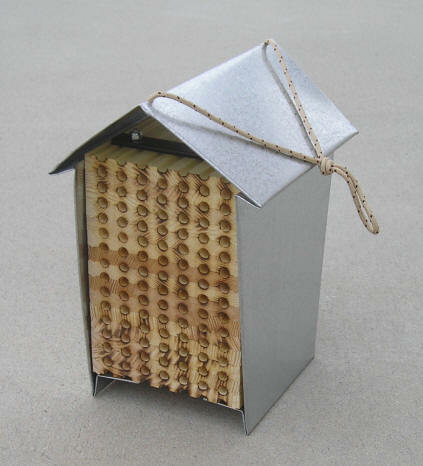 (Prices subject to change) Also good for Osmia aglaia and other small to medium twig nesting bees. Summer mason bees are attracted to this size tunnel. Leafcutting bee nests are temporarily out of stock. Large numbers of laminates (10,000+) can be made by special order. Contact us for additional information. Other sizes available by special order on request. Bosch, J. and W. Kemp. 2001. How to Manage the Blue Orchard Bee, Sustainable Ag. Network Handbook series, Book 5. This book has excellent color photos, lots of details, and especially good sections on parasites and predators, and on incubation and emergence. Excellent if you know these bees; a bit technical for a beginner. $16.45 U.S. plus shipping and handling. Black and white drawings, all of the basics of Osmia management plus information on other kinds of bees. If you are just discovering orchard bees, this is a great book to start with. Also contains a discussion of loose cocoon management, particularly useful for controlling hairy-fingered mites (they don't affect honeybees). Also of interest: The “Garden Variety Native Bees of North America” perpetual calendar helps support the Xerces Society and The Great Sunflower Project. To preview a sample of the calendar, and to place an order, visit: www.nativebeedazzled.com. To order, send check made out to Karen Strickler / Pollinator Paradise to: 31140 Circle Dr., Parma, ID 83660. Or, pay with credit card on PayPal. Foreign orders contact Pollinator Paradise for shipping and handling costs. Copyright © 2002, Karen Strickler. All rights reserved.